CGIAR has done well in Africa. Can it do more? What is needed to increase the impact of its work? How can financial resources be leveraged and technological innovations be disseminated? Are Innovation Platforms an effective means of achieving impact? 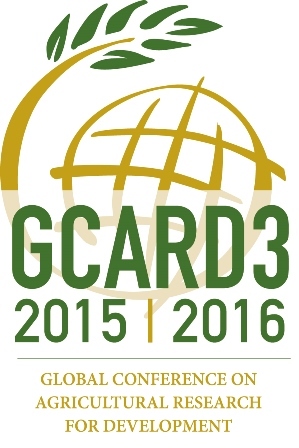 The GCARD 3 Outcomes Statement, hammered out at the 3rd Global Conference on Agricultural Research for Development (GCARD3) held in Johannesburg (April 5-8, 2016), spells out a new Agenda for Action that GFAR and its Partners are determined to take forward, to help partners accross sectors develop their agri-food research and innovations programs and activities towards 2030. The online consultation for Africa is organized in this context and will help fine-tune the outcomes of the GCARD3 Global Event for the Sub-Saharan Africa region, helping partners in GFAR to turn their commitments into Collective Actions transforming national, regional and international agricultural research agendas. GFAR Secretariat is taking the lead for Theme 3 of the online consultation, focused on CGIAR's role in agrcultural development in Africa. CGIAR can contribute to Africa’s agricultural development (AAD) and show impact only when scientists in Africa are skilled and can contribute to AAD. This requires strengthening national agricultural research systems to take advantage of existing (and new generated) knowledge and apply it to local contexts to deliver solutions. Three most significant impacts attributed to the CGIAR in Africa include the work on mealybug of cassava, Nerica and Maize streak virus resistance. GCARD 3 sessions on scaling up science recognized the crucial importance of political ownership of the African science agenda (African Union, NEPAD agency and regional economic communities, STISA 2014 & S3A), but the disappointing level of national investments. CGIAR should reinforce collaboration with other lead international organizations involved in AR4D in Africa based on comparative advantage. Please refer to this Synthesis of Theme 3 for the full report on Day 1, including potential follow-up questions, and challenges identified in the Science Agenda for Agriculture in Africa (S3A) and CGIAR’s Strategy and Results Framework (SRF) 2016-2030 but not yet specifically addressed by participants. Before accessing the online consultation, you may also wish to refer to a specific selection of Background Documents for Day 2, included in the Synthesis. For the Theme 2 Synthesis, click here.